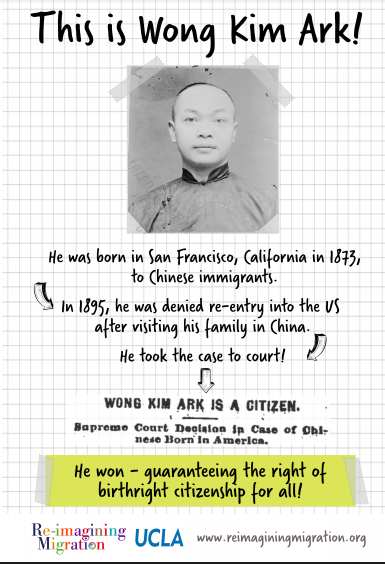 In the 1898 supreme court case the United States v. Wong Kim Ark, Wong Kim Ark won the right of birthright citizenship for everyone born in the United States. The case affirmed principals articulated in the 14th amendment to the United States Constitution. Despite his efforts, very few people in the United States know Wong Kim Ark’s story. We’d like to change that. Consider displaying this free Wong Kim Ark Poster (it is optimized for 11×17 paper) and here are links to lessons and resources you can use to teach the story. Essential Resources from Share My Lesson Webinar (3.14.19) Have your students heard of Wong Kim Ark?